The basic rule “Alignment Comes First”, applies to hands as much as it does to the legs, yet in my experience, very few children with brachial plexus injury (BPI) and/or cerebral palsy (CP) affecting the upper limb has consistent use of splints or taping to maintain alignment. This is not “Good Enough”. Look at the difference in this child with and without Kinesiotape to the affected arm and hand. In this photo, everything is wrong about the child’s position. As the child tries to lift the arm against gravity, there is increased tone in the entire right side of the body. The child is not looking at the hand and if she did look, she would only see the back of the hand, not the fingers. Five minutes later, look at the same child’s arm and hand position. It Is Not Rocket Science! Children with motor control problems of an upper limb need that limb brought into the visual field so that they can learn. Children have to see and play with their hands in order to incorporate them into their body image. Kinesiotape is a terrific technique for use in therapy and can be used at home, in conjunction with other supports. In the second photo, the child is in a better position and some have argued that positioning can correct everything. In my view, this is unrealistic. Parents need the help of supports to minimize the time in mal-alignment. Since January, when I started this series on alignment, I have received a fair amount of “pushback” from both therapists and parents. Parents have told me that they do occasionally do taping, but I have yet to meet one that uses prescribed splints consistently. What really disturbs me about this is that these same parents are quite willing to put the child’s “normal” hand in a constraint device for several hours a day on a regular basis. I believe in Constraint Induced Movement Therapy (CMIT). Its usefulness is not in question. It has been shown to be effective in both BPI and Cerebral Palsy. However, there is a big difference between how a technique is used in a randomized controlled trial and how it is used when it is transferred into a regular therapy session. A key component of this technique is that the affected hand be able to be seen and supported, if needed. It does not work if the affected hand is in a fisted position, out of sight. Using any intervention technique, without alignment, is a waste of time and money. It does not matter if you are a peak performance athlete with a near perfect neuromotor system or a child with an early acquired neurologic problem, alignment is a basic body fact and it cannot be ignored. Skill training requires massed, purposeful practice. Practicing out of alignment is practicing imperfect movement patterns, creating maladaptive habits. Time spent out of alignment is time wasted…worse; it is time spent “wiring in” abnormal movement patterns to the child’s developing brain. Splints and taping are necessary and there are a wide variety of them. How do you know if a particular child can benefit? Take a video of the child sitting and using the hands for some favorite activity. Then have the therapist put on some Kinesiotape and take another video. If the taping is on correctly, there should be an immediate change. There are frequent courses on Pediatric Kinesiotaping in the USA and its use is growing in other countries. There are many demonstrations on YouTube as well. In my view, the best source of information is Kinesiotaping in Pediatrics by Trish Martin and Audrey Yasukawa. Ordering information for this book is available in the Great Ideas section of this site. If you are happy with your regular therapist and she/he does not know about this useful technique…buy them a copy of this valuable resource. It takes a bit of time to be comfortable with handling the tape, but I have yet to meet a therapist or parent who is unable to master it. 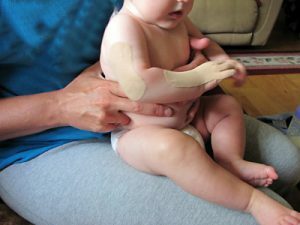 Once you are convinced that the child’s function will be improved by taping, get the appropriate splints. Note that I wrote splints, not splint. There is no one all-purpose item and children need more than one type. Some are relatively rigid and others are more dynamic. The post “How Strong is Your Hand” has some commonly used varieties. If the child is using a TheraTogs System, there are hand supports available as well. The reason you need more than one type of splint is that both the brain and the body rapidly habituate. One rigid splint, used all the time, leads to neglect of the hand, not better use. In contrast, the brain and body both respond to variety. A stronger, more supportive splint can be used during gross motor activities that require a stable joint. Add a little Velcro to it and it can be used to encourage “helper hand” activities and bimanual play. At the other end of a supportive continuum, a less supportive McKie splint, can position the thumb and wrist with the fingers free to be used during feeding or other fine motor activities. How much should you use splints and braces? How often do you have your child brush their teeth? Parents everywhere understand the relationship between brushing teeth and good oral health. Not brushing leads to cavities and eventual loss of teeth. Not maintaining alignment during growth in a child with CP or BPI leads to distortion and chronic musculosketetal pain. The relationship is just as strong and the consequences of non- compliance are more severe. An adult with bad teeth and gums can get implants or dentures. Adults with badly grown bodies get more surgery and pain. The choices seem obvious to me. As ever, I welcome your comments and questions. Yes. The AFO is the most common intervention. There are a wide variety of braces available and it may take some time to find the right one for your child.These 2 are a good start. Billi Cusick’s websites have a lot of good information for parents and therapists.